Peak Design has done it again: The company has broken Kickstarter with its new product. I think these people get together and say, “What can we make that will cause people to lose their minds and buy it with wild abandon?” The company makes quality stuff and designs it very well. The latest offering is the Travel Line, and it I think it’ll meet the expectations of all the people who funded the Kickstarter with $5,206,611. There’s no doubt that this is a well-made backpack. It’s got all the features you’d expect in a bag expected to last a lot of miles. Taped seams, tough fabric, overbuilt closures and plenty of bar tacks. The thing is, while it probably meets the standards, it doesn’t look like a military spec bag. It appears sleek and stylish and comes in black or sage (I was sent the black, but I’m coveting the sage). Personally, I think about the design of bags and gear a lot. A whole lot. I immediately notice weak points and say, “I wish they’d done such and such instead.” I can always qualify my favorite things with several areas that need improvement. As I’ve been using this bag for the last month or so, I’ve only found one flaw, which I’ll discuss below. It’s a tough and well-designed bag, but it doesn’t scream out, “I’m going to climb a mountain with my camera in this bag!” In fact, it really doesn’t look like a camera/tech bag at all (probably because it’s not — it’s a travel bag). It’s also got all kinds of security features built-in. Quick Note: Peak Design has a video at the bottom of each page of its website for every aspect of this bag, and I recommend watching them. The designers show you all the nifty stuff they did and explain all the things you’d probably not notice on your own. There are so many cool features to this backpack, but as this is a photography site, I’m going to focus my efforts on the Camera Cube. It’s a travel backpack, so it’s not dedicated to photography, which I like. They’ve created these camera modules, however, which integrate seamlessly with the pack. They are reasonably tough and protective. If you’re a normal person who remembers there’s a camera on their back and doesn’t go throwing the pack around then this will protect your gear well. It’s not a hard plastic case, but it is as protective as any soft-sided bag I’ve seen, but without as much bulk. It opens either on the large face or from the side so you can access your gear through the backpack like a sling bag. This is handy. I’ve been using the Cube outside of the backpack for transport in my car and sitting in the studio and it’s a very functional setup. The most unusual and distinctive element of the Camera Cube is the dividers. They are adequately rigid, but are slim, which leaves more room in the Cube for your tools. They are also creased so they fold over. This is awesome because I often have lenses or speedlights that don’t take up the entire volume of the section they are stored in. These fold-over sections allow me to stack other stuff on top without stacking things directly on top of each other. There are also several pockets that attach to the dividers. One thing most camera bags include is useless little pockets that are too thin to get stuff out of. These divider pouches, however, are elastic and repositionable so you can always put them in the best spot and you can always get at the memory cards, filters, lens caps, batteries or whatever else you drop into them. The backpack will fit in the carry-on cabinets of even the smallest planes, but in case you had to check the bag the Camera Cube would come out and fit under your seat to keep it safe. Lastly, the Camera Cube is also built to last. Even though it’s intended to be used inside the backpack, it has weather resistant zippers. I’ve appreciated that as I’ve used the Cube in my other backpack for extended backpacking trips. It comes in three sizes. I have the middle size and it fits a large micro four-thirds kit with room for my clothes in the backpack. Here’s the video about the Camera Cubes. Peak Design designed other pouches to help you organize your travel gear, and I really like using them. 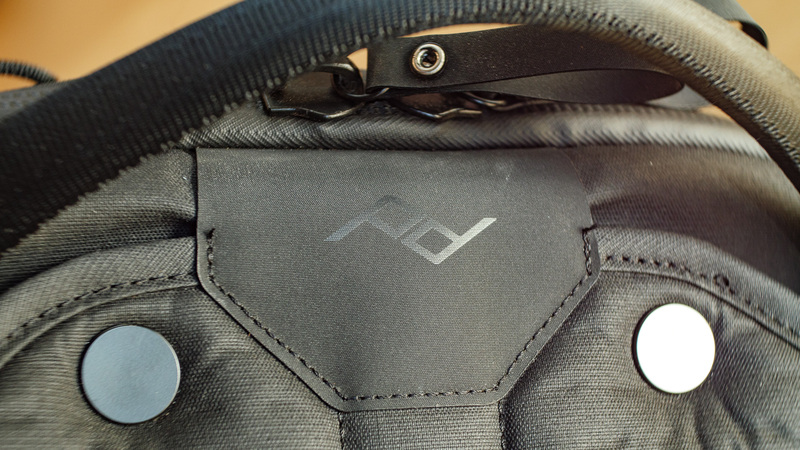 You can buy the Camera Cube and pouches independently of the backpack. There’s one for toiletries, one for cords and charges and all that junk, one for shoes and one for clothes. I was dubious at first that I needed a pouch for my clothes and for my shoes, but now I’m thinking about buying more of them. The pouches maintain the beautiful and simple design of the backpack. The clothes pouch (Packing Cube) and Shoe Pouch are made of super lightweight nylon and are simply the best thing I’ve used for storing clothes. When you carry a bag through three airports on a trip you start doubting everything you put in it as it weighs on your shoulders, but these pouches are negligible. I usually spend a lot of time the night before a trip organizing everything and all that time is wasted as soon as an inspector at the airport gets to work. These pouches preserve the organization and keep clothes from getting wrinkled. The shoe bag keeps my other stuff clean from extra shoes in the bag, and I also like using it for dirty laundry. The toiletries and electronics bags are terrific. They’re like little file folders for all your stuff. Pockets are transparent so you don’t lose things, and they are tough enough to last being moved from bag to bag and trip to trip. I live out of my Wash Pouch (the toiletries bag) at home and I use it on every trip, even when I don’t take the backpack. The same goes for the Tech Pouch: It always has all my cords and chargers and goes with me everytime I leave the house. Hate is a such a strong word — far too strong for this bag. The only thing I can say in criticism of this bag is that it’s a little heavy. When I lifted it out of the shipping box, I was surprised at how heavy it was. Now that I’ve used it quite a lot, I realize that a lot of that weight was the Camera Cube, and that weight can be reduced by using fewer dividers, and I really wouldn’t want to make it lesser because that weight is just the cost of protection for my tools. If it was a camera-only backpack, it would be too heavy. But because the Camera Cube can be used independently of the backpack, it is built much tougher than if it was permanently integrated. The Tech pouch and Wash pouch could be a little lighter, too — but then again, I love that I can use them daily without concern for their durability. The 45L Travel Backpack is very nice. It carries comfortably and keeps your clothes and gear secure. I think it’s going to last a very long time of heavy use. Even though it’s a little heavier than I expected, I think that the durability will be worth it. This is a backpack for people who travel, and it can be customized to carry the stuff you need. It’s sleek enough for daily use around town, but it’s big enough to carry your gear and a couple nights clothes for an airplane trip. Remember to watch the videos for each module. I think when you get this back you will be talking about it with everyone you meet.